Creating Stunning Character Arcs, Pt. 1: Can You Structure Characters? What if there were a sure-fire secret to creating stunning character arcs? Would you be interested in discovering it? If you care about connecting with readers, grabbing hold of their emotions, and creating stories that will resonate with them on a level deeper than mere entertainment, then the answer has to be a resounding yes! 1. The protagonist starts one way. 2. The protagonist learns some lessons throughout the story. 3. The protagonist ends in a (probably) better place. That’s character arc in a nutshell. Easy-peasy, lemon squeezy. What’s to learn? Too often, character and plot are viewed as separate entities—to the point that we often pit them against each other, trying to determine which is more important. But nothing could be farther from the truth. Plot and character are integral to one another. Remove either one from the equation, or even just try to approach them as if they were independent of one another, and you risk creating a story that may have awesome parts, but which will not be an awesome whole. We often think of plot as being about structure, but our notions of character and character arc tend toward the more airy-fairy. Surely, character arc is something that must evolve organically from the characters themselves. Surely, we can’t structure our character arcs without making them formulaic or robbing them of life and spontaneity. We cannot ask which is more important, structure or character, because structure is character; character is structure. They’re the same thing, and therefore one cannot be more important than the other. The three acts of the [story] correspond to the three stages of the hero’s outer motivation. Each change in the hero’s motivation signals the arrival of the next act. 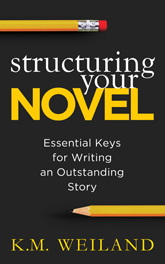 The character drives the plot, and the plot molds the character’s arc. They cannot work independently. But it gets better! Not only does character arc directly influence story structure, it is also a direct influence on theme. In some respects, we might even go so far as to say that character arc=theme. On even just a surface level, the discovery of the integrality of these three most important of all story elements is thrilling. None of them lives in a vacuum. They are all symbiotic. This makes the creation of all three both a little more complicated and, at the same time, a whole lot easier. It’s more complicated for the obvious reason that we have three times as many story elements to keep track of at once. But it simplifies the overall process by rolling all three into a cohesive whole. Once we understand how plot, character, and theme all work together, chances are good that, if we get one of them right, we’ll get all three right. This is the most popular and often the most resonant character arc. The protagonist will start out with varying levels of personal unfulfillment and denial. Over the course of the story, he will be forced to challenge his beliefs about himself and the world, until finally he conquers his inner demons (and, as a result, probably his outer antagonists as well) and ends his arc having changed in a positive way. Many popular stories feature characters who are already essentially complete unto themselves. They’re already heroes and don’t require any noticeable personal growth to gain the inner strength to defeat the external antagonists. These characters experience little to no change over the course of the story, making their arcs static or “flat.” Sometimes these characters are the catalysts for change in the story world around them, so that we find more prominent growth arcs in the minor characters. Negative character arcs offer, arguably, more variations that either of the other arcs. However, at their most basic level, the Negative Arc is just a Change Arc flipped on its head. Instead of a character who grows out of his faults into a better person, the Negative Arc presents a character who ends up in a worse state than that in which he began the story. Over the next month or so, we’re going to be exploring the structure of character arcs. Since the basic Change Arc is both the most complicated of the three arcs and the most integral to understanding the other two arcs, we’ll be spending most of the series discussing the intricacies of how to evolve your character in a positive way. 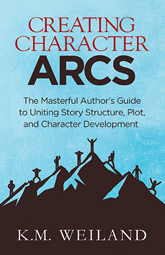 How should we create our characters’ arcs? Where do we find their foundation? 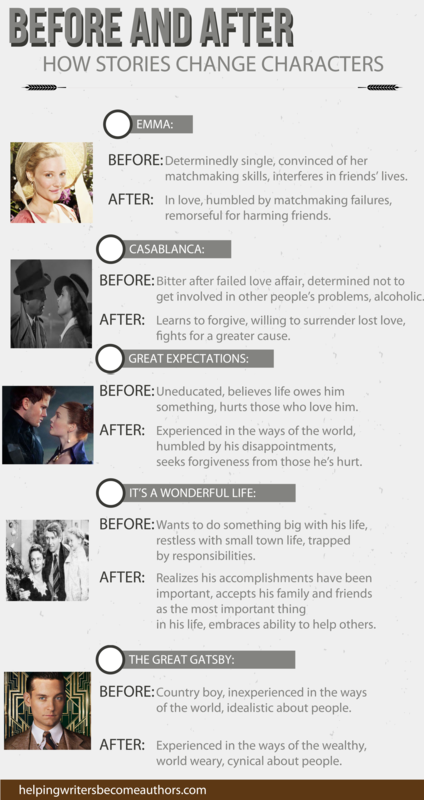 How do the important moments in story structure affect (and are affected by) the important moments in character arc? In short, how does character arc work? And how can you crack the code and create a stunning character arc in every single story? Stop in next week to find out!